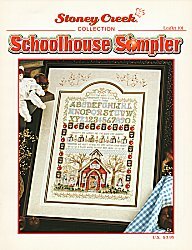 Stoney Creek's Schoolhouse Sampler is a wonderful gift for any teacher or student. It features a little red schoolhouse scene, apples, small blackboards, an alphabet and the sayings, "The most important things in life aren't things," and "Curiosity and wonder are the basis for learning; therefore, we must strive to keep within each heart a place where dreams may grow." Chart only. Our model was stitched on a fat 1/4 yard of 28 ct ivory Quaker over 2 threads with a design size approximately 10"w x 14 3/4"h (139w x 206h Stitches). The only specialty thread used in stitching this design is Kreinik 032 pearl blending filament. Fabric and threads sold separately.